Facilitate lower extremity exercises or just elevate your legs, feet and ankles with the Professional Wedge™. 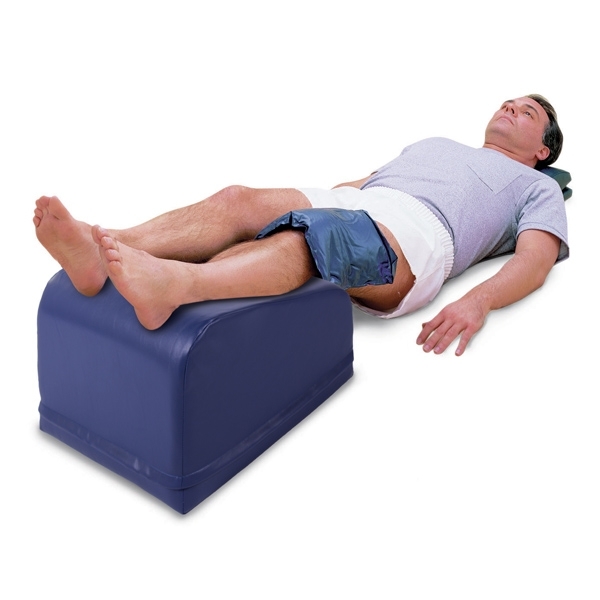 This professional-quality positioning device dramatically improves comfort of supine patients while supporting many exercises. Use it to elevate lower extremities, for lower-extremity exercise or to place the joints and muscles of the low back in a neutral position. The Professional Wedge is constructed of a solid lightweight fire retardant foam core covered with a soft durable vinyl. Includes convenient, attached carrying strap. Available in 16" or 20" width, 13" or 15" height. 21" long. Color choices: Blue, Black and Gray. I have SI Joint pain. Due to the mixed outcomes of the fusion, at this point, I have postponed the surgery and have been in a lot of nerve pain for several years. Lying on my back with my legs up on this wedge is the only position, other than lying on my side, in a fetal position, that doesn&apos;t exacerbate my pain. Every PT clinic should have these!! We have had these wedges for years and as our clinic expands, I continue to order more. They work excellent for leg elevation with IFC/ice, as a leg prop for heat/IFC on the low back, leg prop for cervical traction to relieve pressure on the L-spine and even works great as a back rest. I highly recommend! This thing REALLY makes spinal pain go away FAST--it helps me most if I put the higher end underneath the backs of my knees while lying down. This is REALLY worth the money! !